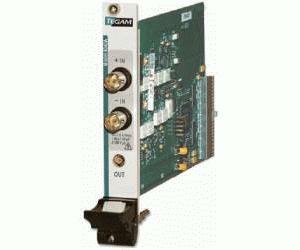 The Tegam Model 4040A easily connects your digitizer or analog inputs to real-world signals ranging from 100 V supply voltages to millivolt detector outputs. Elevated voltages and noisy environments present a barrier to making acceptable measurements with common digitizers that are limited by input impedance and voltage levels. Your investment in a high performance digitizer is significantly enhanced by having an instrumentation grade connection to the point of measurement. The Tegam Model 4040A comes complete with an IVI-compliant driver for LabVIEW, Microsoft C++ and Visual Basic. In addition, an interactive front panel application provides manual control of all of the board''s features.